Background: With the Accreditation Council for Graduate Medical Education implementation of a Single Accreditation System through which allopathic programs can obtain osteopathic recognition, it is vital to continue to support the development of resident osteopathic skills, which could be a challenge without properly trained faculty. The ability and confidence of allopathic and osteopathic faculty in providing Osteopathic Manipulation Treatment (OMT) supervision is unknown, but there is likely a need for faculty development in this area. 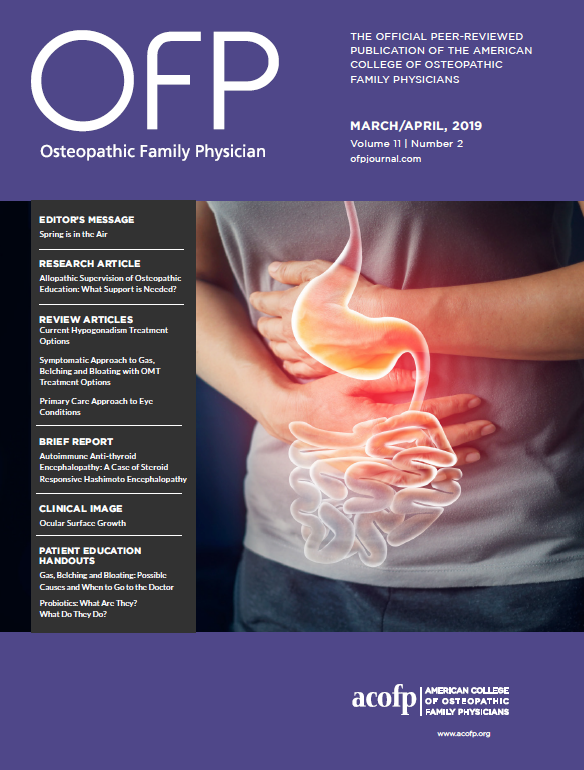 Methods: A 18-item survey to assess allopathic faculty confidence and concerns about aculty development in precepting OMT was completed by program directors and clinical coordinators of programs registered with the American College of Osteopathic Family Physicians. Results: When comparing AOA (n=93) and AOA/ACGME accredited programs (n=80), significantly fewer respondents from AOA programs perceived their allopathic faculty as confident in their ability to precept OMT (36% vs. 50%, respectively, p<0.001). Despite concerns about allopathic aculty’s ability to precept OMT, reported by 64% of AOA programs and 50% of AOA/ACGME programs, only a minority of programs had educational programs in place for allopathic faculty (26% and 41%, respectively). Respondents listed the four most important topics to include as part of faculty development in osteopathic skills as somatic function diagnosis, osteopathic treatment plan theory, muscle energy and myofascial techniques. Conclusion: There was documented concern by respondents regarding their allopathic faculty’s ability to precept OMT, suggesting the need for standardized education on OPP and OMT to better equip allopathic faculty to support osteopathic residents in OPP and maintain OMT skills.